Do you want to help your students remember each other’s names (and you too)? Here’s a simple activity for learning names. It’s challenging, a little bit competitive and quite effective at breaking the ice too! A way that you can get your students to remember names (and you too!) is to do this simple ice breaker speaking activity. Go around the class, and have students say, “My name is ______and I like _______.” The next student repeats the previous ones, and adds their own. It goes on until it finally gets to you and you can impress the students with your memorization abilities! It works best for smaller classes of less than 10. For more advanced students, you can choose something more difficult than “I like,” such as “My name is _________ and last weekend, I __________.” Besides remembering names, you can also use this activity to work on regular/irregular verbs. You can always use this memory circle kind of activity for helping students practice new grammar points, or remembering vocabulary words. This also covers subject-verb agreement (I like, she likes). As you can see, it works much better for beginner students than higher-level ones. Do you feel like you’re stuck in a rut and you need some more solid ideas for your English classroom? Sign up for my newsletter. It’ll be the most useful email you get all week. I promise to never share your email with anyone for any reason. Get your courses started off on the right foot with some engaging, interesting and fun ESL icebreakers. They’ll help your students get to know each other and you get to know them. I find that using some icebreakers at the beginning of the course sets it up for success for the following weeks and months. Sounds great, right? It is. A class or two of icebreakers can certainly make a big difference in terms of the atmosphere for the rest of them. 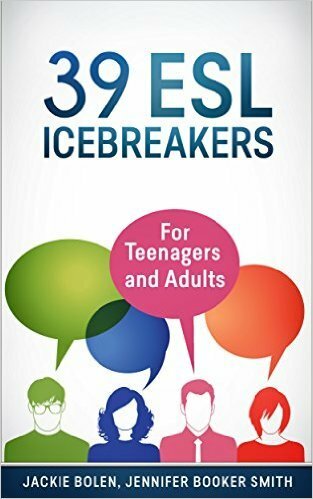 If you need some ideas, then you’ll want to check out this book on Amazon: 39 ESL Icebreakers. There are dozens of activities and games to choose from. The book is available in both print and digital formats. Keep a copy on the bookshelf in your office as a handy reference tool. Or, the digital version on your phone or tablet for lesson planning at your favourite coffee shop. It really is that easy. Have your Say about this Ice Breaker Speaking Activity! What’s your favourite way to help your students remember each other’s names? Leave a comment below and let us know what you think. Also be sure to give this article a share on Facebook, Pinterest, or Twitter. It’ll help other teachers, like yourself find this useful resource. ice breaker activity, ice breaker speaking activity, icebreaker activity, icebreaker game.